India GK Question Sample Paper 104: India General Knowledge (GK) Sample Question Paper No. 104 with Collection of 20 Question of India GK Questions under GK Quiz in PDF @ India GK Sample Papers. India General Knowledge (GK) and General Science (GS) Questions are also available with Quiz on daily basis. 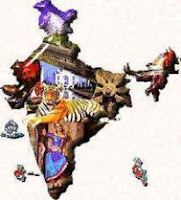 Q.1701 Which state holds country's first e-cabinet meet in September 204 ? Q.1702 National Highway (NH 1A), renumbered as NH 44 belongs to which state ? Q.1703 National AYUSH Mission (NAM) is Associated with which sector ? Q.1705 The main source of Revenue for Google is ? Q.1706 In Union Budget 2014 -15, how much percent of GDP is target for Fiscal deficit 2014-15? Q.1707 Asia’s first Nobel prize winner ? Q.1708 How many new smart cities are proposed in Budget 2014-15? Q.1709 In Union Budget 2014 -15, Revenue Deficit seen at how much % for FY15? Q.1710 Crisis Management Center for women will be open at -------_? Q.1711 "Xi Jinping" is president of ? Q.1712 "Mohiniattam" dance is related to which state ? Q.1713 Who is appointed new chief of the National Commission for Women (NCW) ? Q.1714 "Lavani" dance is realted to which state ? Q.1715 Chinese President during his India, landed at which city ? Q.1716 Which bank recently Celebrated its 80th Foundation Day ? Q.1717 India will be Partner Country in Hannover Messe Fair 2015. This fair will be held in which country ?